Under the International Center for Integrated Mountain Development (ICIMOD), experts from different regions have come together to develop the first Hindu Kush Himalayan assessment report, which was released on January 5, 2019. The report corroborates a 2014 report by the International Panel on Climate Change (IPCC) showing that as temperatures rise with climate change, at least one-third of the Hindu Kush Himalayan glaciers will be depleted by 2100, even if global warming is held at 1.5 degrees Celsius. This report has received much media attention due to its alarming scientific findings of glaciers melting on the Hindu Kush Himalayan region, which would in turn would impact the overall water, energy, and food security in the region. Glaciers on the Tibetan plateau play a key role in supplying perennial water for many countries. But there is a growing concern about the impact of glaciers melting on the Tibetan plateau and the availability of water in the region. The Tibetan plateau has seen an increase in temperature of approximately 0.3 degrees C every 10 years. This means that over the past 50 years the temperature has increased by 1.3 degrees C, which is three times the global average. If this current trend continues, many Chinese scientists believe that 40 percent of the plateau’s glaciers could disappear by 2050. Scientists from the Chinese Academy of Sciences (CAS) also predict that temperature on the plateau will increase by up to 4.6 degrees C by the end of the century. Professor Liu Shiyin, who led a survey on these glaciers, said that retreating glaciers will release melt water and create lakes, and ultimately it will lead to disaster. As a unique and high plateau, the Tibetan plateau is highly sensitive and vulnerable to global climate change. In the past few years, the Tibetan plateau has seen record number of floods, landslides and mudslides as well as increases in lake volume in different parts of Tibet. The impact of natural disasters on the Tibetan plateau is not only restricted to the plateau, but it has consequences far beyond it — for example, in a downstream country like India. The entirety of agriculture in northern India is highly dependent on rivers originating in Tibet and any changes in the flow of these rivers will have significant consequences. Then there are also extreme events such as glacier lake outburst floods (GLOF) that could pose immense danger for many countries. In October 2018, debris blocked the flow of Yarlung Tsangpo River in Tibet, which threatened downstream India and Bangladesh with flooding. The melting of glaciers will initially cause more floods in the region until they melt completely, providing more water in the short term. But in the long run, with depleted glacial ice, runoff will be dramatically reduced. Many scientists predict that the quantity of runoff water from melting glaciers is likely to increase at least until 2050, and then it will decrease. An average of 247 square kilometers of glacial ice has disappeared every year since the 1950s. Continued shrinking of glaciers will affect runoff and water resources downstream, then it will induce water scarcity. Moreover, in addition to climate change, the unregulated construction of Chinese dams and canals might further exacerbate the impact of climate change and increase the problem of water scarcity. With China’s ambition to reduce carbon emissions through developing clean energy, China is likely to build more dams along transboundary rivers. Geostrategist Brahma Chellaney writes: “China, by building increasing control over cross-border water resources through hydroengineering structures, is dragging its riparian neighbors into high-stakes games of geopolitical poker over water-related issues.” Hence, Tibet’s water resources have become an increasingly crucial strategic, political, and cultural element that the Chinese are intent on managing and controlling. With a large proportion of the region’s population already living in poverty and dependent on natural resources for food and livelihood, limiting access to fresh water will push the entire region deeper into vulnerability. China has control over Tibet, “the Water Tower of Asia,” and thus the future of Asia’s water lies in China’s hands. China, a water scarce country due to uneven distribution of water resources, is facing considerable pressure on water resources to meet its own industrial growth, urbanization, and population growth. Moreover, China is facing domestic water conflicts, mainly on issues like inter-jurisdictional water pollution and hydropower dam construction. These domestic water conflicts and water scarcity could provoke civil unrest. Therefore, these concerns might compel China to utilize transboundary rivers to meet its water scarcity challenge. The development of water infrastructure projects on Tibet’s transboundary rivers has already infuriated many downstream countries and triggered international criticism. For example, China’s construction of hydroelectric dams along the Brahmaputra River has become a source of friction between China and India. China has also dammed the upper Mekong River, which has become a major source of conflict between China and Southeast Asian countries. Many scholars and experts have warned about possible future “water wars” between China and India, and the same dynamics could play out in Southeast Asia. The key to mitigating transboundary water conflicts and advancing water cooperation in Asia is largely in the hands of China. It is a time to recognize Tibet’s importance to regional security. 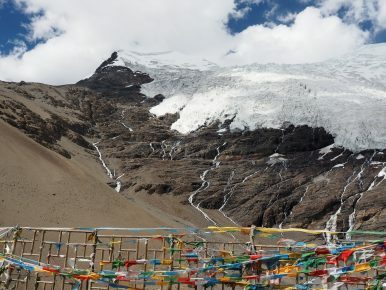 The ICIMOD assessment report is one of many reports confirming the melting of glaciers on the Tibetan plateau, which could cause significant disruptions to future water scarcity. To effectively address the impacts of climate change on the Tibetan plateau and transboundary water conflict, there is a need for a regionally integrated approach to water resources management. If unsustainable practices and mismanagement of water resources are not addressed, fresh water will become a precious commodity, the control of which could spark conflicts in Asia. Mistrust over shared rivers remain high between China and its neighbors. If China and the rest of the continent want to turn potential water conflict into constructive engagement, then a water dialogue is necessary. Dechen Palmo is a research fellow at the Tibet Policy Institute. The views expressed here do not necessarily reflect those of the Tibet Policy Institute. The Geopolitics of Language in the HimalayasNew Climate Change Fears, Old Mekong ProblemsThe Future Shape of Mekong Cooperation‘Skeleton God’: Exorcising Demons in TibetCan ASEAN Save the Mekong River?